Pokémon GO is delving once more into the Sinnoh Region, with more Pokémon introduced in Sinnoh making their way onto Pokémon GO. As confirmed via the TPC website, your Sinnoh Stones will now evolve Lickitung into Lickilicky and Tangela into Tangrowth. However as seen in the above image, it looks like we could be gaining some more evolutions as well as standalone Pokémon, including Gallade, Froslass and Yanmega! On top of this, Fossil Pokémon from Sinnoh such as Cranidos and Shieldon will be seen in the wild, as well as more Sinnoh Pokémon hatching from Eggs. So make sure to be exploring more and incubating those Eggs, so you don’t miss out! Along with this, it looks like TPC have also teased some big changes to battling in Pokémon GO. 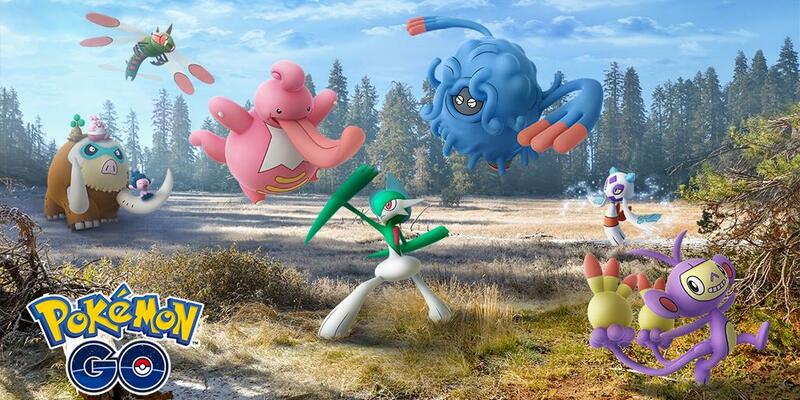 Raid Battles look like they will be buffing the Pokémon fought even further, whereas existing moves will be undergoing some power changes and certain Pokémon will be able to learn new moves by using a Fast or Charged TM. See more info below from the website. Many of these Pokémon are particularly powerful, and they’re just in time for the latest update, which also introduces some big changes to battles. You’ll find Pokémon you fight against in Raid Battles are more powerful and sturdier than ever before. Some Pokémon moves will become weaker or stronger, and certain Pokémon will be able to learn new moves by using a Fast TM or Charged TM. This will surely help those Pokémon perform better against particular opponents in battle. With some pretty big changes on their way, what are your thoughts? Shoutout to Fletch for the tip!